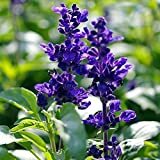 Salvia officinalis growing shrub of the genus Salvia also known as Sage or Common sage, Salvia officinalis perennial evergreen plant and also used as fragrant ornamental medical plant, can grow in mediterranean, subtropical or temperate climate and growing in hardiness zone 4-11. 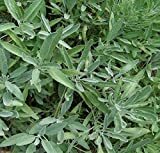 Leaves green some cultivars green with yellow or white, hairy and in oval shape, there are to different growth of leaves winter and summer, the winter leaves smaller and thick. Hairy green some cultivars green with yellow or white, in oval shape, there are to different growth of leaves winter and summer, the winter leaves smaller and thick.